This is a new press release that went out and is now circulating! So proud of authors Deborah Fezelle and Sherry Yanow and their wonderful novel that has garnered rave reviews! Philadelphia –Shorehouse Books is pleased to announce that its first title The Evil That Men Do by Deborah Fezelle and Sherry Yanow has been the subject of rave reviews. The book, which straddles the mystery, paranormal, romance and suspense genres, was inspired by the real-life murder of co-author Deborah Fezelle’s sister. Fezelle told her story to romance novelist Sherry Yanow, whom she met online where Yanow hosted a soap opera message board, and asked if Yanow would read the book she had started to write. The two women became close friends and decided to collaborate on the novel. The Evil That Men Do focuses on protagonist Nick McDeare, a tortured man whose brother is murdered and his ghost wants answers. McDeare winds up living in the beautiful widow’s brownstone so he can find those answers. The novel takes many twists and turns and contains a surprise ending that has left many fans asking for more. “This book gave me the opportunity to write about my two great passions: the world of the theater and my continuing love affair with New York City,” Fezelle explains. Although it was a long-distance collaboration between Fezelle who lives in Ohio and Yanow who resides in upstate New York, the two authors had no problem in the collaboration process. With the book getting favorable reviews, the two authors have decided to collaborate further. Fezelle and Yanow are already working on a sequel to EVIL called A Walking Shadow. 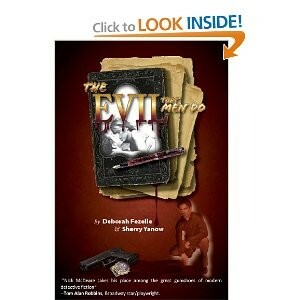 Fezelle also has a web series based on EVIL in production. Shorehouse Books is the non-humor arm of HumorOutcasts Press, founded by Donna Cavanagh who also founded HumorOutcasts.com, a popular online humor magazine that highlights the work of more than 90 humorists, authors, TV producers and comics who hail from all over the world.. The two-year-old site is now ranked among the top 80,000 sites globally and top 14,000 sites in the United States. Wow congratulations to Deborah and Sherry and of course Shorehouse Books for making it possible! Bravo! Awesome! Awesome! Awesome! I HAVE that book. I MUST find time to read it! And I can’t wait!